Is this the Year of the Colour City Dragons? Greetings and Happy New Year everyone – is this to be there year of the Colour City Dragons?? – the answer to that is in your court (or should that be PADDLE). Chinese New Year (CNY) – Saturday 12th for Club teams, Sunday 13th Feb (for DAA and Community teams) – just 5 wks and 3 days away. All CNY team members need to get to at least one regular training session a week – PLUS a 30 minute session specifically for the CNY Team. This prepares you better for racing, develops TEAM spirit AND best seating plan for maximum effective paddling. Remember Together Everyone Achieves More. We could make the 30 minute extra training before or after one of our regular sessions or maybe Sunday morning, it would need to be no later than 8am so we minimise impact on the kayaking business (and our agreement with OCC). The State Championships are on March 19th at Penrith, just 5 weeks after CNY. There’s absolutely no reason why CC Dragons shouldn’t be competing. It’s a 500m; you’re already fit for the sprint races so slight change of training for the longer races. I need your name and fee by 01st March at latest. $20 adults, $10 juniors. Very Good News– John Davis Motors has paid the lease on the 2nd boat $990. Any of you have the opportunity to thank John or his son, personally for this very generous sponsorship, please do so. It makes training sessions so much easier for the coach and as many of you know even more fun. Lets see if we can raise the numbers training to at least 30 each session – that way we can use both boats and start to do some competitve paddling among ourselves and really improve on times. The Club’s Christmas Cook Out on 12th Dec was a very pleasant evening – well for the hosts it was – and Molly the dog thought it was – well, she thought all her Christmas’ had come at once, strict diet for her next day. Thank you to all those who came – George and I very much enjoyed having you with us. The Club has a few old style (blue and white) Club shirts for sale at less than cost price. They are great for training sessions or just wearing proudly around town to promote our Club. Sizes available 12, 14, 16 in ladies, small and large in mens (difference being mens have sleeves). Cost $20 each. The order of paddles, paddle bags and gel pads has arrived and I know of one young lady who found one in her Christmas stocking. For rest who have orderd but not yet received them, check with me. Paddles $157, bags $50 ($75 for a double I think),gel pads $32. Last month I mentioned Lake Cargelligo Dragonflies will be getting their boat on Jan 15/16th. The following email from them speaks for itself. Those interested in going – let me know. We want you to come PLEEZE!! Just let me know how many people will need accommodation. Barb has offered her camping ground on the Lake for any one that wants it. I can book motels. I think the more people the better. Please pass on to Dubbo that we would love you all to be there for our launch. The Come & Try Day starts at 10 am on Saturday Morning. Launch is on at 5pm Saturday evening followed by a “Hungi” at the Boat Shed. Early morning paddle for those who are interested on Sunday Morning before Melanie and crew go back. As far as social weekend, that would be great as well. Maybe we can organize a date when you are here for the Launch. I suspect the whole Shire will be at the Hungi – that’s all 1300 of them!! The Pan Dragons at Bathurst won’t be far behind the Lake Dragonflies. Their boat arrives Friday 14th, they may need some helpers to lift the boat off the trailer if anyone is available to help. Pan Dragons have not yet decided whether they are having a Come and Try Day on Sun 16th or later. The Steering Committee are currently feeling little overwhelmed by it all, but all will be well. As a ‘well established’ Club I’m sure Colour City Dragons will be able to encourage the Pan Dragons and give them a hand from time to time. Perhaps those not going to Lake will keep Bathurst in mind and be able to go over there on the 16th if they do decide to put their boat out. I can see regional regattas happening here in the not too distant future. Be sure to leave enough time to respond when Phil Lambert calls for help putting the roof on the Boat Shed yard. This could be anytime now, and how good will it be not to have to drag those tarps on and off, much as we have appreciated the use of them, heaps better than bailing boats out before we even get them on the water. Sweeps. Megan has joined Taylor in very capably handling the boat and no sorry neither of our girls will be first junior sweeps in DBNSW, but depending when Megan does her accreditation, she could be the youngest to complete that. 19th Feb at Jindabyne is next accreditation day. But first or not we are all very proud of you girls. Phil Lambert and Susie Fletcher need to sweep at 2 more races to gain L3 accreditation. Drummers I’ve been able to get some more information on correct procedures for drumming, strange as it may seem there is nothing written, until now. An experienced drummer with a Sydney Club has put together some notes for us, so at last Elise – we’ll let you loose with the drum – and others who’d like to give it a try. For those not aware, the drummer plays an important role in the boat from a safety aspect as much as anything else. Sunscreen and flyspray is always on hand. We now have a big pump bottle courtesy of the Cancer Council in back of the blue Landcruiser. If you forget to bring water its available in the esky in the Landcruiser. $1 bottle goes to Club (or helps to buy more water). Outback Dragons, Dubbo. Spare a thought for our dragonboat friends at Dubbo. They’ve had no on water training for weeks and it’s likely to be several more weeks before the Macquarie is navigable. Saturday/Sunday 12/13 February Chinese New Year Regatta. 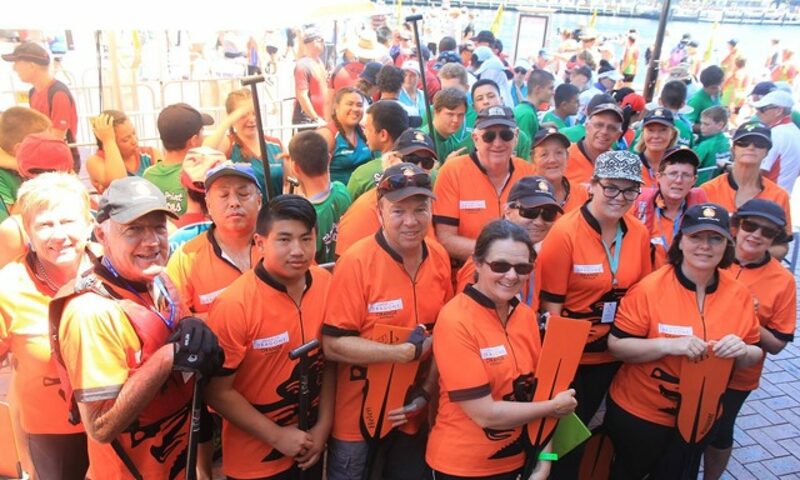 Saturday 5 March – Shellharbour Regatta – volunteers or enter a team?? May peace break into your home and may thieves come to steal your debts. May the problems you had, forget your home address! May 2011 be the best year of your life.